Vince Poscente accelerates achievement for leaders in our corporate landscape. According to Vince, "The Olympic movement is pervasive in our society on many levels. Primarily, we can all relate to the pursuit of excellence. We can also appreciate the three core principles of the pursuit of excellence, international understanding and fair play alongside the motto of Citius, Altius, Fortius (Swifter, Higher, Stronger). But the unwritten motto for high performing leaders is “Smartius.” Inevitable obstacles spring from basic human nature. In the personal and corporate landscape, real life issues and the realities of competition pervade. The solutions to roadblocks for leaders of corporations are uncovered in this entertaining and thought-provoking message." Vince Poscente is a New York Times bestselling author of six books on accelerating goal attainment in the landscape of human nature. He is an Olympic athlete and inductee into the Speaker Halls of Fame in Canada and USA. Book Vince Poscente for your next event. 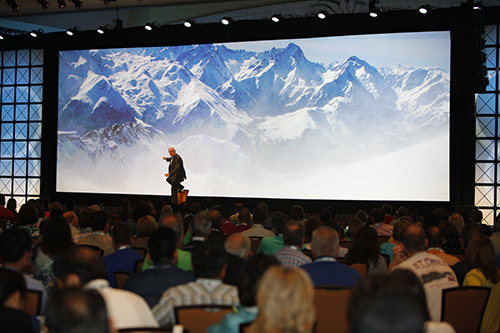 Hundreds of Fortune 500 corporate events and annual association leadership conferences have brought Vince in to uniquely open or close their convention with the FULL SPEED AHEAD LEADERSHIP keynote. Our practical, 5-step system to engage leaders and boost productivity applies in a variety of settings. Whether as an entertaining after dinner speaker or as a guest speaker during the day, Vince Poscente is the cure for a lack of motivation, the antidote to stop procrastination and the guide for getting out of a rut. A list of our clients dedicated to activating leadership and accelerating productivity.